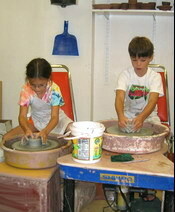 Pottery Wheel classes, lessons & parties... only at Quiggly's Clayhouse! Please SCHEDULE your session before visiting the studio! Lessons are only provided if you call in advance (one to two weeks preferred, particularly for weekend sessions)! 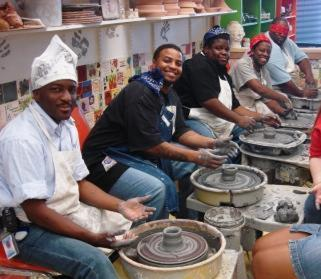 We have ten pottery wheels, and a dedicated staff interested in teaching you one of the most unique, hands-on art forms practiced the world over. 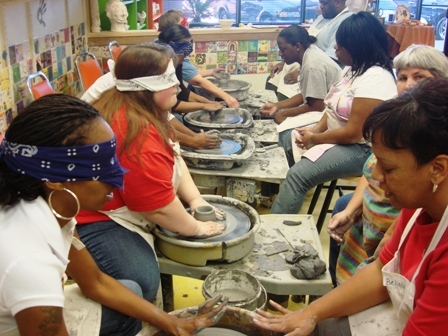 If you've always wanted to learn to "throw clay" you've found the place! Learning to use the potters wheel takes patience, focus, and practice. It is also super-relaxing and very rewarding. Prices include instruction, clay and firing. Tax applies to all sales. Give our wheels a spin, without instruction, whenever you like for an hour and a half! Only $40 per person/per wheel(includes 6 pounds of clay & bisque firing of all the pieces you create)This pricing is specific to friends who already have wheel experience and just want to throw for personal reasons. Must have pottery wheel experience to throw on the pottery wheels without instruction. Relax, socialize and bond with your team over food & beverages (you bring, or we cater). Then everyone learns to make a vessel on the wheel! Afterward, we split up into teams of two with the potter blindfolded. The partner then instructs the blindfolded person on how to make a vessel. The result is always a messy, yet successful exercize in retention, teamwork and patience! Only $35/person +tax. There is also a $35 booking fee for our party room. Register here for Pottery Wheel Lessons, Wheel Workshops, Adult Wheel Night and Team-building Events on the wheel! !